If you know that a sector has arrived when it makes for trade wars between countries, then solar energy clearly has. Last year, the US imposed anti-dumping duties on Chinese imports of solar panels; now the EU has proposed the same. The Chinese have in turn threatened that they will take action against European exports of poly-silicon, the material used for manufacturing solar panels. In February this year, the US filed a case against India at the World Trade Organization (WTO) for “favouring sourcing of panels from domestic manufacturers”. Earlier this month, Canada lost a similar case filed against it at WTO for its support to domestic manufacturers in procurement of solar panels. So, what you thought was all good and nice has suddenly become the biggest bugbear in international trade relations. It tells you that this sector is growing, it is lucrative and it makes for fierce trade politics and competitiveness. But this is only part of the story. The big issue underlying these “wars” is the role of solar energy—a new source of power to lead the world to a low-carbon future and thus, away from the looming climate crisis. It has big objectives. First, it has to become cheap so that it can achieve grid parity and compete with the dinosaur in the market: coal and oil. This can only happen when its deployment is greatly scaled up. Secondly, it has to reinvent green growth. This is why solar energy has been “sold” as an alternative industry, which will add to employment. It is the economy of the future. Thirdly, it has to secure needs of the most energy-poor. In other words, this relatively expensive and certainly most modern energy system should reach the poorest millions living in darkness. This would mean cutting the cost of supply, building networks to distribute and doing all that has not been done before. Solar energy, therefore, has a tall order to deliver. The problem is countries have never considered the competing and often conflicting objectives. As a result, solar energy instead of becoming the messenger of the new cooperative world is getting embroiled in battles. Consider this. The Chinese have managed to bring down prices and in the process led to the collapse of manufacturing across the world. It is estimated that in 2011 PV modules cost 60 per cent less than what they did in 2008. The first objective of solar energy is close to being met. But cheaper supply from China has hit manufacturing elsewhere. This has led countries to look for options to subsidise their industries and, in turn, damaging others. The US, for instance, provides cheap loans tied to purchase of domestically produced solar systems. Indian solar manufacturing has suffered fatally. The second objective of using this new industry for green growth is being destroyed. It is for this reason that governments are hitting back. In all countries the developers—the companies that buy solar systems to install power stations—are objecting to what they call are unnecessary protectionist measures at the behest of inefficient domestic producers. They say cheaper solar power systems have resulted in large-scale deployment, which in turn has given jobs and growth. The result of this powerful push back is that within days of announcing the anti-dumping duties, the US and EU solar associations have issued the Shanghai Declaration asking for a “rule-based trading system” and no duties. Over 1,000 industries have written against the proposal. Hectic parleys are on between the US, EU and China to find a “satisfactory” answer. No doubt these dependent trading partners will find a solution that suits their mutual interests but where will this leave the original purpose of solar power? This is where the world needs to stop and think. The fact is that countries need manufacturing capacities for domestic employment and to build the future industrial base. The fact also is that solar energy, even with substantial cost reductions, needs policy and financial support for growth. In all this, governments must provide the framework, and not just leave it to the market. The global aim should be to support this source of power, even if it distorts the so-called market. That’s why it is essential that all trade cases be withdrawn. It should be accepted that countries will provide fiscal support for building manufacturing and that domestic procurement would be facilitated. This is part of the bigger design. The Indian government must continue with its policy to mandate domestic content in solar installations. But to make it work it should also provide cheap loans—similar to what the US government does through its EXIM Bank—conditional to the purchase of locally produced systems. Most importantly, the support must be focused on meeting the third objective: reaching clean energy to the poorest. This would mean supporting decentralised power grid that feeds power directly to households. This will not be easy. The cost of such systems is high, cost recovery low and the ability to pay even lower. Let’s remember, the dinosaur can be slain only if there is new energy. New dawn needs new light. Who is the one not playing by the rules – India or the US? The importance of Solar Energy has still to sink into the minds of Indians, Whether it is government, industry or public. Some over-optimist may disagree by pointing to a few solar panels here and there and a few megawatts of government projects. One of the saviours of our country could one day be the rate of growth of adapting solar energy on massive scale. It has to quickly scale up to gigawatts per year and then multiply the rate. Any investment in other renewable energy might not be worthwhile as there is no alternative like the Sun. Free energy for at least 10 hours a day. The government can very well do it but does not want the population to be free of stress in any respect. Keep promising a lot but deliver little is the method of any government. Getting the people to adapt to Solar Energy at present cost would be very difficult except that someone is able to kindle a national fervor on the importance of adapting even at a steady speed and coerce the government to do the rest. must continue with its policy to mandate domestic content in solar installations. One should not get carried away merely by the fancy slogans like "Net-Zero"buildings unless it is feasible with indigenously available solar panels.Especially in multistoreyd buildings,one may even think of net 10%,Net 20%,etc and not necessarily net Zero. I fully support the view that,The Indian Govt should take it as a policy to mandate domestic installations. It is indeed sad that Indian industry is unable to compete with Chinese. The government and policy makers are entirely responsible for not nurturing Solar Power manufacturing sector. Notwithstanding; it is a bigger crime to prevent Chinese solar panels from selling in India. It is an alternate to petroleum imports and help us to reduce pollution. 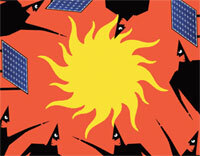 Let us not play into the hands of lobbyist but allow solar power to grow in India whichever way possible. What is the lowest theoretically possible limiting cost of various solar energy conversion methods, now or in foreseeable future, and what affects these limits. Is it possible to use a system using only the greenery like plants, algae, etc. and a set of reflectors, to convert all the incident solar energy, by repeatedly exposing the plants to it till all of it has been consumed by them ? Is there any theoretical limit beyond which the green plants, algae etc. cannot convert solar energy even if we provide a system of reflectors to expose them again and again to it ? Why make trade wars when all efforts should be concentrated on getting to our common energy future. Better match each others's support for clean energy. The next generation of solar will be far more efficient and effective. Line Solar in the Netherlands has developed the MLC solar panel which provides 21.5% efficiency, and 32% higher efficiency compared to leading commercial solar panels. MLC panel production costs are 40% lower, an industry record! Production costs are below $0.50/Wp, 40% lower compared to current leading commercial panels. This panel is expected to come onto the market next year. Achieving a balance between a free market and support for local industry will not be easy. China has achieved competitiveness in the solar industry that is the envy of the world, so naturally competitors in the West and in India are crying foul. Instead of supporting research and development in India, you are suggesting "domestic content" provisions for installing solar panels in India. This means that Indian companies will fight for the crumbs of the global industry and India will forever be confined on the margin. It seems we can't get our minds out of the "reservation" mentality whether it is in jobs or in manufacturing.